Today, Flashlight Commentary is pleased to welcome author Emma Jane Holloway to our little corner of the net to discuss her three part series, The Baskerville Affair. Welcome to Flashlight Commentary Emma. To start things off, please tell us a bit about The Baskerville Affair series? What inspired you to write the series? Where did the idea for it come from? Some time ago, I wanted to write a story about Sherlock’s niece. I was curious as to what a teenaged girl would make of her famous uncle. In the end, Evelina is an adult in this series, but their relationship is still key to who she is. She’s caught between the Victorian love of the fantastic and their equally strong love of science. Her journey is all about reconciling those two aspects of herself and facing the darker aspects of that combination. Book one, A Study in Silks, blends your unique brand of steampunk with the classic works of Sir Arthur Conan Doyle. Did you find it intimidating working with such revered material as the Sherlock Holmes canon and were you nervous at how your adaptation of it might be received? I read the Conan Doyle stories when I was about ten and have reread them many times since. Obviously, I wanted to do him justice and went back to the source material for a lot of my detail. He’s such a strong character I didn’t have any trouble putting him on the page, but he’s not meant to be a main character—although he does steal a few scenes here and there. At the same time, this isn’t a classic Conan Doyle story. We have magic and flying airships. I had to make a credible Holmes who might not be a fan of sorcerers but would be fully prepared to deal with one—in a highly rational manner, of course—if such an individual knocked on his door. To an extent, I relied on the fact that Conan Doyle himself was very interested in the supernatural. Many Victorians treated spiritualism and psychic phenomena with a scientific lens, as they would any other subject of interest, so I approached it from that viewpoint. You up the ante in book two, A Study in Darkness, by adding a well-known historic element to the mix. How did you approach combining your story with the Whitechapel murders and the notorious Jack the Ripper? I did a lot of research, went to London to see what was left of the locations, and I confess to a moment of utter trepidation. Not only is there a boatload of information out there to sort through—which is daunting enough—at some point an author is faced with the fact that they are writing about actual tragedies. Although I have my own perpetrator of the killings with a unique motive, in the end I treated the subject material as levelly as I could. The victims and the descriptions of the murder scenes are as they were reported, and so are the Ripper’s letters. I had to leave some detail out to keep the book under control, but I felt either glossing over or romanticizing the deaths wasn’t justified. I also kept the fact that the murders became a political hot potato. The East End was rife with social unrest, and the higher-ups had their own reasons for solving the case that had nothing to do with dead women. The Black Kingdom remains shadowed in mystery until book three, A Study in Ashes. Why did you opt to wait so long before allowing readers into that corner of Evelina’s world? First, there was enough going on already. I wanted to allow readers to become familiar with what was already in play without introducing another element. Also, I thought it made sense to show the discovery of the mysterious underground as the characters realized exactly what was there. The underground is present throughout the stories but disguised. I lay the foundations very early in the first book with the first murder. There is a direct chain of events from that moment all the way through to the end of A Study in Ashes as the consequences of that death keep clicking over like dominoes until the guilty parties finally pay the price for their crimes—but in ways they never suspect. The nature of the Black Kingdom is thematic to the series and the real core of book three. It’s the place—either literal or psychological—where the characters are remade. Each one has to face their dark side and accept it as a strength or a weakness. Most of them do it there or in connection to its presence. The Black Kingdom provides that journey into a shamanic unknown. I'm sure you have many favorite moments, but was there one that was particularly fun to write? I loved the airship scenes. They swash and buckle! Was there any scene in the series that was particularly difficult to put to paper? Some parts were emotionally difficult, but some were also technically challenging. There is a series of battle scenes in book three that put me through my paces. By that point, a lot of players have to come together and the choreography had to be planned just right. It’s one of those things that should work well enough the reader doesn’t even notice it’s going on, although a lot of sweat went into it! Evelina is courted by both Tobias and Niccolo over the course of the story. How do her suitors differ and what does each represent to your heroine? A yes, the boys. Tobias is wealthy, handsome and heir to a viscount’s title, and that puts him above Evelina on the social ladder. If he had his way he would be an inventor, but gentlemen aren’t supposed to work with their hands. Essentially, he’s frustrated, ignored by his father, and has never been trained for any useful occupation. At the same time, he has an idealistic streak, and this is what draws him to Evelina. Tobias is by far the most complex character of the bunch. Nick is the opposite. He’s a practical man of action and goes for what he wants. He’s Evelina’s first love and is part of her wild, magical circus childhood. Although they love each other, they have to stay apart because the combination of their magical talents creates havoc that could end up getting everyone in the circus killed. It’s the great irony of Nick’s impoverished existence that he has an enormous amount of power he has no idea how to harness. They are both amazing young men, but Evelina is planning to go to college. Dr. Magnus is easily one of the most complicated and charismatic antagonists I've come across. What inspired him and what makes him tick? Magnus is a fun character, because his agenda is wholly his own. At first, he left me guessing along with everyone else. His past is mysterious, but we know he’s old and powerful and spent time in the Black Kingdom learning his art. He was very loosely inspired by the figure of Simon Magus, and part of that legend was his consort, Helen, the incarnation of wisdom in female form. My Magnus is trying to create that perfect companion, but with less success and for more nefarious reasons. He’s bonkers, but the question is always how much. I think what makes him interesting is never knowing what’s sincere, what’s evil, and what’s just madness. Let's talk about Sherlock for a moment. Did you find it difficult getting into the head of a character you did not create? Conan Doyle does such a good job of creating Holmes and Watson, it’s not that hard to conjure them. I love the BBC version of the stories with Jeremy Brett, and I think some of his interpretation crept into my character. In my opinion, Brett had the nuances of the character down perfectly. Speaking of Doyle’s characters, can you tell us a little bit about your approach to Professor James Moriarty? Moriarty is interesting, because there are only a handful of facts about him in the original. That left the field wide open to the imagination. I present him as younger, putting him more at the start of his criminal career, but I kept everything else. He’s a sneaky character and he appears long before we know who he really is. Let me just say math teachers are indeed evil. Sometimes fiction takes on a life of its own and forces the author to make sacrifices for the sake of the story. Is there a character or element you wished you could have spent more time with? I would have loved to research the Theosophists and the Victorian spiritualist movement more thoroughly, but I ran out of time. I hope I’ll have a chance to explore those in a future book. Assuming you could sit down with one of your characters, maybe go out and discuss things over drinks, who would you invite and why? Bucky Penner, because he is the level-headed observer. He’d know everything about everyone and still be kind about it. These books are purely entertainment. My hope for readers is always that they dive into the world and have a great time. If I can take a reader on an adventure—make them forget work or school or whatever it is they need a break from for a few hours—then I’ve done my job. Finally, what is next for you? Any other projects waiting in the wings? Absolutely. I need to find out what happens next! About the Author: Ever since childhood, Emma Jane Holloway refused to accept that history was nothing but facts prisoned behind the closed door of time. Why waste a perfectly good playground coloring within the timelines? Accordingly, her novels are filled with whimsical impossibilities and the occasional eye-blinking impertinence—but always in the service of grand adventure. Struggling between the practical and the artistic—a family tradition, along with ghosts and a belief in the curative powers of shortbread—Emma Jane has a degree in literature and job in finance. She lives in the Pacific Northwest in a house crammed with books, musical instruments, and half-finished sewing projects. In the meantime, she’s published articles, essays, short stories, and enough novels to build a fort for her stuffed hedgehog. About the Book ~ A Study in Darkness: Before Evelina’s even unpacked her gowns for a country house party, an indiscretion puts her in the power of the ruthless Gold King, who recruits her as his spy. He knows her disreputable past and exiles her to the rank alleyways of Whitechapel with orders to unmask his foe. As danger mounts, Evelina struggles between hiding her illegal magic and succumbing to the darker aspects of her power. One path keeps her secure; the other keeps her alive. For rebellion is brewing, a sorcerer wants her soul, and no one can protect her in the hunting ground of Jack the Ripper. About the Book ~ A Study in Ashes: Not even Niccolo, the dashing pirate captain, and his sentient airship can save her. But Evelina’s problems are only part of a larger war. The Baskerville Affair is finally coming to light, and the rebels are making their move to wrest power from the barons and restore it to Queen Victoria. Missing heirs and nightmare hounds are the order of the day — or at least that’s what Dr. Watson is telling the press. But their plans are doomed unless Evelina escapes to unite her magic with the rebels’ machines–and even then her powers aren’t what they used to be. A sorcerer has awakened a dark hunger in Evelina’s soul, and only he can keep her from endangering them all. The only problem is… he’s dead. Fiona Buckley's A Traitor's Tears is a tough book for me to review. The mystery is solid enough, not as gripping as I might have liked, but interesting in its way. Problem is I couldn't help feeling I would have enjoyed this piece more if I'd been already familiar with the Ursula Blanchard series. I can't speak for the rest of the books, but this installment is particularly reliant on pre-established relationships and while it is certainly possible to read it as a standalone, I can't say I'd recommend doing so. Not unless you enjoy feeling like something of a third wheel. The author recaps essential information, but no amount of rehashing is substitute for good old fashioned character development. I don't mean to sound overly critical as I'm sure Buckley's characters and their backgrounds are firmly established in Ursula's earlier adventures, I am simply stating new readers are not afforded a lot of opportunity to connect with her players and that makes it really difficult appreciate the drama of their circumstances and really undermines the inherent value of this particular story. Critically acclaimed author Robert Klara leads readers through an unmatched tale of political ambition and technical skill: the Truman administration’s controversial rebuilding of the White House. In 1948, President Harry Truman, enjoying a bath on the White House’s second floor, almost plunged through the ceiling of the Blue Room into a tea party for the Daughters of the American Revolution. A handpicked team of the country’s top architects conducted a secret inspection of the troubled mansion and, after discovering it was in imminent danger of collapse, insisted that the First Family be evicted immediately. What followed would be the most historically significant and politically complex home-improvement job in American history. While the Trumans camped across the street at Blair House, Congress debated whether to bulldoze the White House completely, and the Soviets exploded their first atomic bomb, starting the Cold War. Indefatigable researcher Robert Klara reveals what has, until now, been little understood about this episode: America’s most famous historic home was basically demolished, giving birth to today’s White House. Leaving only the mansion’s facade untouched, workmen gutted everything within, replacing it with a steel frame and a complex labyrinth deep below ground that soon came to include a top-secret nuclear fallout shelter. The story of Truman’s rebuilding of the White House is a snapshot of postwar America and its first Cold War leader, undertaking a job that changed the centerpiece of the country’s national heritage. The job was by no means perfect, but it was remarkable—and, until now, all but forgotten. Since we met, my husband has teased me for reading books like Robert Klara's The Hidden White House, likening me to Abigail Chase and giving me a hard time for burying myself in information that will never come up in regular conversation which is why I found it so amusing when the tables turned and he suddenly wanted to know more about the book I'd casually mentioned over dinner a few days before. Suspicious, I began fishing for details and managed to discover his curiosity was sparked by the passing reference to Truman's reconstruction project in Olympus Has Fallen and the discussion that followed made me appreciate Klara's work all the more. The White House is one of the most iconic buildings in the United States, but it is also one of the most enigmatic. We all know what it looks like and the names of those who've called it home, but we don't value the history of the building itself or the effort required to preserve this living piece of our nation's heritage. In point of fact most of us are completely unaware of how close we came to losing it through slip-shot engineering and poor maintenance. Declared in danger of eminent collapse in 1948, Truman essentially had the building gutted and rebuilt from the inside out, leaving only the famed exterior intact. Klara's work details the massive scope of the project, chronicling how the building fell into such a state of disrepair and the extensive reconstruction that was required to save it. Enjoyable and informative, I appreciated both Klara's insight and light humor. A great read for anyone interested in 1600 Pennsylvania Avenue. Born to slave-holding aristocracy in Richmond, Virginia, and educated by Northern Quakers, Elizabeth Van Lew was a paradox of her time. When her native state seceded in April 1861, Van Lew’s convictions compelled her to defy the new Confederate regime. Pledging her loyalty to the Lincoln White House, her courage would never waver, even as her wartime actions threatened not only her reputation, but also her life. Van Lew’s skills in gathering military intelligence were unparalleled. She helped to construct the Richmond Underground and orchestrated escapes from the infamous Confederate Libby Prison under the guise of humanitarian aid. Her spy ring’s reach was vast, from clerks in the Confederate War and Navy Departments to the very home of Confederate President Jefferson Davis. Although Van Lew was inducted posthumously into the Military Intelligence Hall of Fame, the astonishing scope of her achievements has never been widely known. In Chiaverini’s riveting tale of high-stakes espionage, a great heroine of the Civil War finally gets her due. Civil War era lit is not easy for me to read. I think it a wonderful period with a wealth of compelling material, but I find a lot of writers get caught up in the morality of the conflict and end up releasing very simplistic and one-sided accounts that glorify the virtuous north against the villainous, bigoted and degenerate south. I get the appeal of the good vs. evil allegory, but it's been done a million times and at the end of the day, I find it banal and cliché. Take the concept of self-emancipation expressed in Daniel Woodrell's Woe to Live On, the loss of innocence explored in Charles Frazier's Cold Mountain or the transformation of southern culture illustrated in Margaret Mitchell's Gone With the Wind. These are sort of deeper themes I find appealing and I don't think Jennifer Chiaverini pushed that envelope with The Spymistress. Lizzie is so blinded with her own self-righteousness that she never recognizes she wears death's blackened shroud, never bears the weight of the scythe she wields against her southern brethren and never shoulders an ounce of responsibility for the tragic fate of those who died by the information she spirited north. Perhaps I am alone in this, but it is hard to consider her compassionate when she seems so devoid of empathy for those who suffered the repercussions of her actions. Maybe deep characterization isn't Chiaverini's thing. I haven't read her before so I'm not in a position to say one way or the other, but when I realized I wasn't going to find what I was looking for in Lizzie, I started looking at the bigger picture and the obstacles faced by those involved in the espionage ring, but unfortunately, I didn't find what I was looking for there either. The distinct lack of tension bothered me. There is an implied element of danger, but I never felt as if Lizzie and her co-conspirators were facing a tangible threat and that really undermined the magnitude of what they were doing. Maybe I'd have been more convinced if there'd been more detail about their efforts or the actual information they were passing but as is, I spent my reading comfortable in the knowledge everyone would be okay in the end. War is not simple, romantic or politically correct, but Jennifer Chiaverini's The Spymistress is all of the above. I give Chiaverini points for shedding light on a story with which I was not familiar, but I think she played it safe and that the piece could have been a lot stronger if she'd dug a little deeper and offered up something more complex than what I saw here. No man wanted to seem a coward, and no woman wanted to seem indifferent, which made the Van Lews’ absence from sewing bees and dress parades all the more conspicuous. Lizzie could not mistake the sidelong glances and whispers that followed her whenever she strolled around Church Hill. Everyone knows Benedict Arnold—the infamous Revolutionary War General who betrayed America and fled to the British as history’s most notorious turncoat. Many know Arnold’s co-conspirator, Major John André, who was apprehended with Arnold’s documents in his boots and hung at the orders of General George Washington. But few know of the integral third character in the plot; a charming and cunning young woman, who not only contributed to the betrayal but orchestrated it. Socialite Peggy Shippen is half Benedict Arnold’s age when she seduces the war hero during his stint as Military Commander of Philadelphia. Blinded by his young bride’s beauty and wit, Arnold does not realize that she harbors a secret: loyalty to the British. Nor does he know that she hides a past romance with the handsome British spy John André. Peggy watches as her husband, crippled from battle wounds and in debt from years of service to the colonies, grows ever more disillusioned with his hero, Washington, and the American cause. Together with her former lover and her disaffected husband, Peggy hatches the plot to deliver West Point to the British and, in exchange, win fame and fortune for herself and Arnold. Told from the perspective of Peggy’s maid, whose faith in the new nation inspires her to intervene in her mistress’s affairs even when it could cost her everything, The Traitor’s Wife brings these infamous figures to life, illuminating the sordid details and the love triangle that nearly destroyed the American fight for freedom. 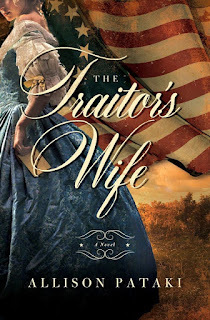 I was more than a little excited when I first stumbled across Allison Pataki's The Traitor's Wife. Though familiar with the story of Benedict Arnold's betrayal, I'd never read a fictional account of it and couldn't believe my luck when Howard Books approved my request for an ARC four months before its Feb. 2014 release date. Looking back on that enthusiasm makes it hard admit, but I'm a reviewer and can't deny this debut wasn't as satisfying as I'd hoped it'd be. Though I enjoyed Pataki's keen understanding of the historic subject matter, the book itself left me confused and bewildered. Peggy Shippen is the obvious center of this piece which is why I was disappointed with the lack of clarity in her character. There are a handful of moments in which she is as astute as Abigail Adams and as seductive as much speculated widow of Mount Holly, but these are largely overshadowed by episodes of spoiled self-indulgence and pathetically infantile outbursts. Maybe it is just me, but the inconsistency in her manner, personality and personal motivations undermined the authenticity of Pataki's portrayal and often left me wondering if the author had a definitive idea of who this woman was and the role she played in the conspiracy. I had similar difficulty with Clara. I don't think the audience is ever afforded a real understanding of Peggy's confidant and that made it hard to connect with her on an emotional level. Perhaps I've been spoiled by maids such as Hannah in Philippa Gregory's The Queen's Fool or Barbara in Eva Stachniak's The Winter Palace, but I genuinely feel The Traitor's Wife would be a stronger piece if more effort had been put into developing Clara outside the Shippen and Arnold households. Characterization issues plagued the supporting cast as well, but I think I've said enough on that particular subject and there is another aspect I want to touch on before wrapping up. The atmosphere, dialogue and values depicted in these pages did not feel authentic to colonial American culture. I don't know if this was an intentional decision meant to benefit Pataki's readers or indicative of the author's inexperience as a writer of historic fiction, but either way I didn't expect to this piece to be quite so theatrical and fluffy. I recognize I read an ARC edition of The Traitor's Wife and that the finished publication may differ dramatically, but I'm not entirely convinced four months of spit and polish will rectify all of my concerns and though I certainly appreciate the book as light historic fiction, I'm not sure I would recommend it to those looking for a deeply compelling narrative of the conspiracy that might have crushed the revolution and the ambitious dreams of America's founding fathers. Today, Flashlight Commentary is pleased to welcome author Mary Sharratt to our little corner of the net to discuss her latest release, Illuminations. Welcome to Flashlight Commentary Mary and thank you for stopping by. First off, where did you find this story and why did you feel it needed to be told? I lived for many years in Germany where Hildegard has long been revered as a cultural icon, admired by both spiritual people of all backgrounds and completely secular people. It actually took me quite some time to summon up the courage to write about such a great, multifaceted woman—I was so in awe of Hildegard, I didn’t even know where to begin. I also felt intimidated to be writing about such a religious figure. But in the end, I decided her story was too important not to tell. She came from such inauspicious beginnings, given as a child to a life of absolute silence and submission, and yet she triumphed against all odds to become the greatest voice of her age. I find her life and work as relevant today as it was in the 12th century. Though she was literally walled into a house of darkness and pain, she burst free to build a house of light, a house that has room for us all. What about this woman appealed you as an author? Hildegard’s story arc is so incredible: offered to monastic life at the age of eight and then, at the age of 42, finally breaking her silence to speak and write of the luminous visions she had kept secret all her life. Then, in midlife, she went on to achieve so much. A 21st century person would be fortunate to achieve what Hildegard did—founding two monasteries, writing nine books, composing 77 sacred songs and one liturgical drama, going on four preaching tours—but for a 12th century woman, this was an unheard of achievement. When Hildegard and her sisters finally break free of their confining life in the anchorage and Hildegard can walk in her beloved forest again with her friend Volmar to witness her reverence and joy to be reunited with the glory of the natural world. The scenes where eight-year-old Hildegard was walled into the anchorage with the disturbed fourteen-year-old Jutta von Sponheim. Sometimes fiction takes on a life of its own and forces the author to make sacrifices for the sake of the story. Is there a character you wish you could have spent more time with? In the original manuscript I submitted to my editor, I had a whole long elaborate subplot about Maximus, the runaway monk and apostate who sought shelter with Hildegard and her sisters at Rupertsberg, but the subplot was a bit unwieldly and needed to be edited out. I was sad to have to “kill” Maximus’s story. I’d sit down with Hildegard any day. Out of all the historical characters I’ve written about, she is certainly the wisest! I hope my readers come away with a closer familiarity with Hildegard and her life and work which are so relevant for our own times. I believe modern woman can glean much from Hildegard’s visions of the Feminine Divine and how she created a special space for spiritual women of all traditions. Both men and women can be deeply inspired by her vision of Viriditas, the sacred life force and vitality manifest in the green growing natural world. We need to safeguard our beautiful green planet. I share Hildegard’s dogged stubbornness, but I wish I had more of her wisdom, vision, and incredible courage. My new novel-in-progress, THE DARK LADY’S MASQUE, is based on the story of Aemilia Bassano Lanier, daughter of an Italian court musician who played in the courts of King Henry VIII and Elizabeth I. An accomplished poet in her own right, Lanier is also believed to be the Dark Lady of Shakespeare’s sonnets. In my novel, I explore her star-crossed love with Shakespeare, her fellow poet. About the Author: The author of four critically acclaimed historical novels, Mary Sharratt is an American who lives in the Pendle region of Lancashire, England, the setting for her acclaimed Daughters of the Witching Hill, which recasts the Pendle Witches of 1612 in their historical context as cunning folk and healers. She also lived for twelve years in Germany, which, along with her interest in sacred music and herbal medicine, inspired her to write Illuminations: A Novel of Hildegard von Bingen. Illuminations won the Nautilus Gold Award for Better Books for a Better World and was selected as a Kirkus Book of the Year. For more information, please visit Mary’s website and blog. You can also follow her on Facebook and Twitter. About the Book: Skillfully weaving historical fact with psychological insight and vivid imagination, Illuminations brings to life one of the most extraordinary women of the Middle Ages: Hildegard von Bingen, Benedictine abbess, visionary, and polymath. Offered to the Church at the age of eight, Hildegard was expected to live in silent submission as the handmaiden of a renowned, disturbed young nun, Jutta von Sponheim. But Hildegard rejected Jutta’s masochistic piety, rejoicing in her own secret visions of the divine. When Jutta died, Hildegard broke out of her prison, answering the heavenly call to speak and write about her visions and to liberate her sisters. Riveting and utterly unforgettable, Illuminations is a deeply moving portrayal of a woman willing to risk everything for what she believed. The most glamorous story in the annals of American history is that of the lovely Peggy Shippen, arch-conspirator of the Revolution, of her love for the gallant young Major John Andre, and of the part she played in the treason of West Point. This novel, which is based on a new and authentic interpretation of the events leading up to that treason, is one of great dramatic intensity. Young, beautiful, ambitious, Peggy Shippen was inevitably drawn into the web of intrigue, of plots and counter-plots woven by Major John Andre, the man she loved, and by Colonel Aaron Burr, his adversary. Benedict Arnold, Peggy's husband, is revealed as a selfish, unscrupulous scoundrel to whom gold was the only god. Major Andre appears, not as the hated spy of orthodox history, but as a brave and talented young man, who placed honor above everything else, and for it sacrificed love, happiness, even his life. Mr. Haines brings the hectic, dramatic background of the Revolution vividly to life in this brilliant historical novel. I discovered Edwin Irvine Haines' The Exquisite Siren after reading Allison Pataki's The Traitor's Wife. The latter had left me wanting a more compelling fictionalization of Peggy Shippen and while I feel Haines' interpretation succeeded in fulfilling that desire, I can't deny this wildly imaginative narrative has its own unusual particularities. The story begins just after Washington is chosen commander in chief of the army by the Second Continental Congress and closes with Benedict's betrayal and André's death. Notable appearances include Banastre Tarleton, Wilhelm von Knyphausen, Elizabeth Loring, Charles Cornwallis and William Howe. At four hundred and forty-four pages, The Exquisite Siren is a fairly lengthy novel and the language and prose are certainly indicative of older fiction, but even without these hurdles I would have great difficulty recommending this piece to other readers. Haines you see, plays fast and loose with history, refusing to allow the facts to dictate the story he wanted to tell. Is his work amusing? Yes. It is creative? Certainly. But is it accurate? Surely not. Not unless you believe Peggy to have frequently ridden incognito around the country, delivering messages and information as one of Henry Clinton's most trusted agents. That being said, there were a few things I really liked about this book... you know, once I'd accepted the author's freely adapted point view. Peggy's motivations and personality for example, are believable and remain constant throughout the novel, the relationship she shares with André has some actual depth, and Benedict, despite falling prey to the manipulations of a conniving young woman, still boasts a certain degree of integrity. I also liked that Haines was able to illustrate the American Revolution without glorifying the rebel cause and in so doing, managed to maintain a rather neutral tone of voice. There is without a doubt a time and place for tellings such as this and while The Exquisite Siren was in no way the story I was looking for, I can't deny that it appealed to both my quirky sense of humor and appreciation for the unconventional. "A woman saved France. Another ruled it and built an empire. A woman made England great and powerful and defeated the tyranny of Spain. A woman destroyed the mighty nation if the Aztecs. A woman can save England's colonies and end the rebellion." "My lady," I said, "we don't choose out path, but we are called. Sometimes God's calling appears unfathomable." Giveaway: Susan Wittig Albert's A Wilder Rose!